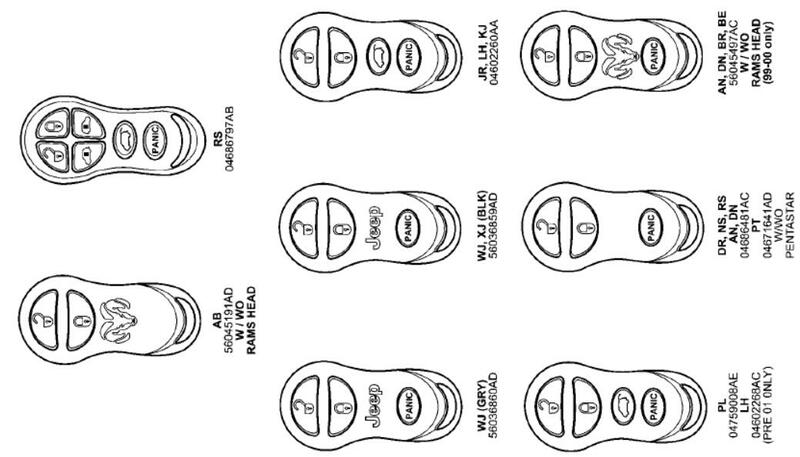 This article show a guide on how to use Launch X431 tool to program remote keyless entry for Jeep Cherokee. 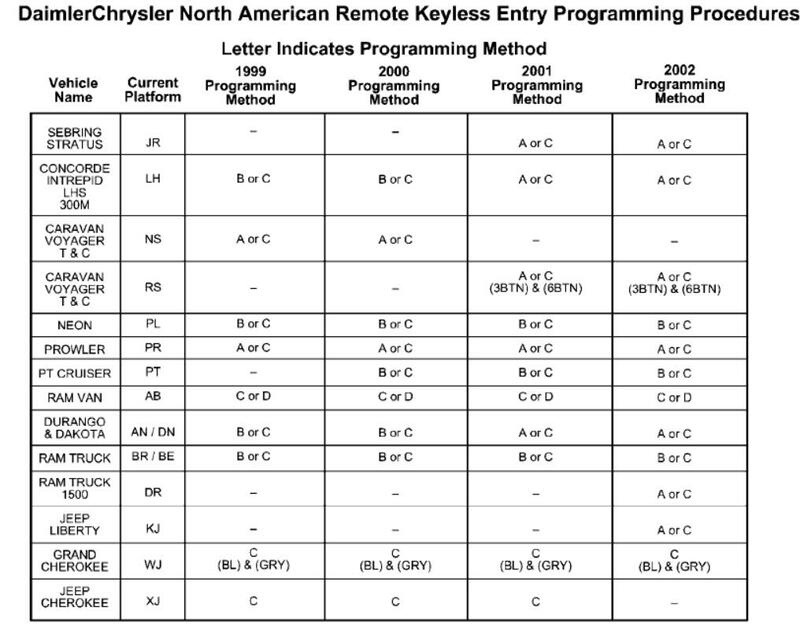 A Remote Keyless Entry (RKE) Programming Procedures Card (Publication No.81-170-00011) is being provided with this Technical Service Bulletin to simplify RKE transmitter programming on 1999 – 2002 North American vehicles.Additional copies of the RKE publication, 81–170–00011 (Fig. 1), can be ordered from DDS Distribution Services, LTD. Their number is 1-800-890-4038. NOTE: THE RECENTLY RELEASED MILLER SPECIAL TOOL, “RF DETECTOR NO. 9001”, SHOULD BE USED TO DETERMINE IF THE TRANSMITTER IS WORKING BEFORE BEGINNING PROGRAMMING PROCEDURES. THERF DETECTOR INDICATES IF THE TRANSMITTER IS WORKING, NOT IF IT IS PROGRAMMED TO A VEHICLE. NOTE: PLEASE READ INSTRUCTIONS FULLY BEFORE ATTEMPTING TO PROGRAM TRANSMITTERS. 1.Press (LOCK) button 5 times at 2 second intervals to resynchronize transmitter. Attemptto function transmitter, if working as designed discontinue programming. 2.Turn ignition to run position. (Allow ignition chimes to stop). 3.Using any original (working) transmitter, press the [UNLOCK] button for 4 to 10 seconds. 4.Within the specified 4 to 10 seconds, continue pressing the [UNLOCK] button and press the [PANIC] button for 1 second and release both buttons (AN/DN release either button first). A chime will sound to indicate that the transmitter programming mode has been entered (allow 3 seconds for chime to sound). 5.Press [LOCK] and [UNLOCK] buttons simultaneously for 1 second and release (a short chime will sound for AN/DN). 6.Press and release any button on the same transmitter and a chime will sound after successfully programming the transmitter (locks will cycle for AN/DN). NOTE: (FOR DR 0NLY ) A CHIME WILL NOT SOUND ON STEP #6 FOR THE FIRST TRANSMITTER PROGRAMMED, BUT WILL SOUND UPON PROGRAMMING THE SECOND TRANSMITTER. 7.Repeat steps 5 through 6 to program additional transmitters. 8.Turn ignition to OFF position. Transmitter programming mode will discontinue after 60 seconds (30 seconds for AN/DN and RS). (All transmitter programming must be completed within time specified). 1.Press [LOCK] button 5 times at 2 second intervals to resynchronize transmitter. Attempt to function transmitter, if working as designed discontinue programming. 2.Turn ignition to the run position (Allow ignition chimes to stop). 3.Using original transmitter, press and hold the [UNLOCK] button on the transmitter for between 4 and 10 seconds. 4.Continue to hold the [UNLOCK] button and press the [PANIC] button. A chime will sound to indicate that the transmitter programming mode has been entered (Allow 3 seconds for chime to sound). 5.Press a button on all transmitters to be programmed into the system including any previously programmed transmitters; a chime will sound when each transmitter has been programmed. 6.Turn the ignition to OFF position to exit the transmitter programming mode. Program Method C (Dealer Program Method) *Can be used for any type transmitter. 1 .Press [LOCK] button 5 times at 2 second intervals to resynchronize transmitter. Attempt to function transmitter, if working as designed discontinue programming. 3.Plug DRBIII to vehicle’s 16–way data link connector. 4 .Follow Service Manual and DRBIII instructions to program transmitters. 1.Locate the dark green program enable wire connected to pin #1 of the 16-way data link connector under the left side of the instrument panel. 2.Connect the program enable wire terminal to a good ground. 3.Insert the key into the ignition and turn the ignition switch to the ON position. The power locks will cycle (Lock and Unlock) indicating that program mode has been entered. 4.Using the transmitter to be programmed, press either [LOCK] or [UNLOCK]. The power locks will cycle indicating the transmitter has been programmed successfully. 5.Repeat step 4 to program additional transmitter. 6.Disconnect the program enable wire from ground to exit program mode. 7.Turn the ignition to the OFF position and remove the key. NOTE: REFER TO DAIMLERCHRYSLER MDS2 SYSTEM OR PARTS DEPARTMENT TO OBTAIN THE CORRECT PART NUMBER AND REVISION FOR SPECIFIED VEHICLE.